Roughly 80 percent of the mass of the universe appears to be dark matter: an invisible material that seems to interact with ordinary matter only through gravity, without emitting light or energy. 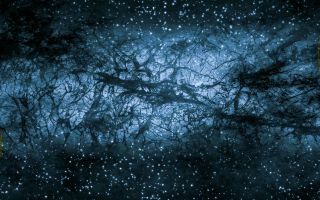 Scientists cannot detect dark matter directly and don't yet know what it's made of, but they track its influence based on the motions of stars and galaxies. The presence of dark matter is necessary to explain the universe's current structure. As 2019 nears, physicists are hard at work on the next generation of dark matter detectors, and on parsing confusing data from detectors that already exist. A summertime sparkle seemed to hint that researchers had found dark matter, but it looks like those scientists were wrong. Scientists think there's a 'dark matter hurricane' coming, but it's definitely not going to kill you. It's actually kind of exciting. To study what is accelerating our universe's expansion, scientists will use a new experiment that employs choreographed robots to watch millions of galaxies every 20 minutes. Mysterious quantum stars that act like single, monster atoms could form surprisingly quickly. A new map of dark matter all over the universe could reveal things scientists don't know about dark energy. A remarkable new image from the Hubble Space Telescope captures a close-up view of some of the most distant galaxies in the universe.